A classic pattern with a modern twist, the Brooke Medical ID Cuff is a hypoallergenic stainless steel medical ID cuff for every occasion. 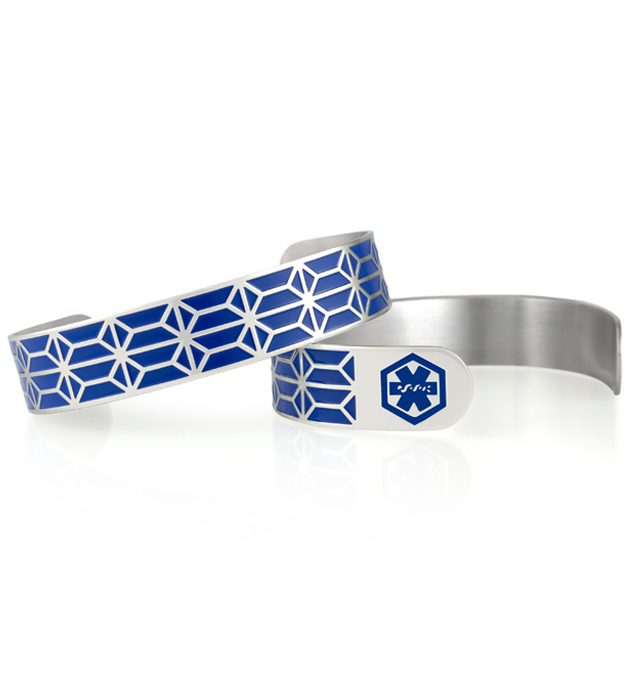 This art deco inspired cuff features a stunning geometric pattern against a royal blue background. Each end of the Brooke Medical ID Cuff bears the internationally recognized medical caduceus symbol, which alerts emergency response personnel to your medical information, custom engraved on the inside. Whether you or your loved ones wear a medical alert bracelet for food allergies, heart conditions, lymphedema, autoimmune diseases, blood thinner use, or any other medical condition or treatment consideration, med alert cuff bracelets are a terrific option. Comfortable and on-trend, these durable medical ID bracelets are easy to adjust and put on, making them ideal for people experiencing swelling of the extremities, weight fluctuations, or dexterity challenges.